Historic Function Remarks: Built as a one-room country school in 1894. The district formed in 1877 - at least that's when the earliest meeting minutes were recorded. 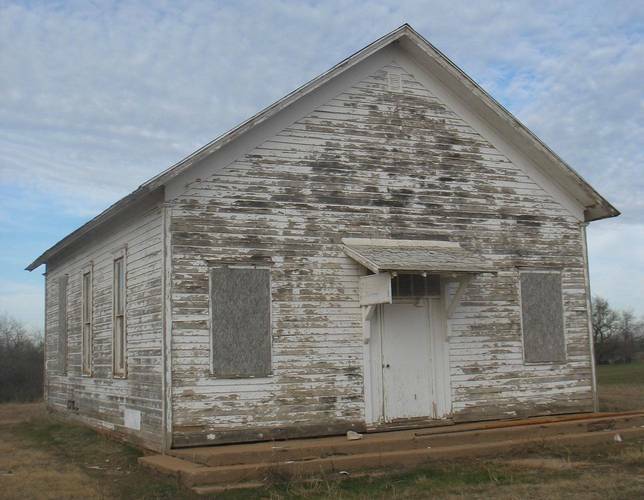 The district built a small wood-frame school in 1878, but built a new larger building in 1894. It is not known why a new school building was needed. Present Function Remarks: Owners relocated the schoolhouse to this property December 2009 and have been restoring it. Their goal is to use it as a learning environment where guests can see how children once attended school. Physical Description/Remarks: Victorian-era school built with the rosette blocks above the doors. Two coat rooms flank the entry vestibule at the front of the building. Rehabilitation work on the interior has revealed the likelihood of two original front doors - one each entering into a cloak room. The current configuration was likely in place by 1920. A bell-tower once graced the gable, but it was removed sometime after the 1950s. Condition Remarks: Some materials with termite/weather rot have been/will be replaced as needed. Small addition at northwest corner, which was dismantled during the move and reattached at the new location. Date Notes: Based on school district meeting minutes. Ancillary Structure Remarks: Hand well pump and one of two outhouses were relocated in 2009, but have not yet been placed on foundations. Belleview Schoolhouse - Original location, circa 2009. Photo by V. Brunhoeber, 2009. Belleview Schoolhouse - window detail. Original location, circa 2009. Photo by V. Brunhoeber, 2009. Belleview Schoolhouse - interior. Original location, circa 2009. Photo by V. Brunhoeber, 2009. Belleview Schoolhouse - basement. Original location, circa 2009. Photo by V. Brunhoeber, 2009. Belleview Schoolhouse. Side addition. Original location, circa 2009. Photo by V. Brunhoeber, 2009. Belleview Schoolhouse - outhouse. Original location, circa 2009. Photo by V. Brunhoeber, 2009. Belleview Schoolhouse - pump. Original location, circa 2009. Photo by V. Brunhoeber, 2009. Belleview Schoolhouse. New location, view looking NW from 120th St. Photo by S. Martin, 8-25-2011. Belleview Schoolhouse. New location, view looking NE. Showing front (south) and side (west) elevations.Photo by S. Martin, 8-25-2011. Belleview Schoolhouse. New location, view looking N. Showing front (south) and side (east) elevations. Photo by S. Martin, 8-25-2011. Belleview Schoolhouse. New location, view looking NW. Showing front (south) and side (east) elevations. Photo by S. Martin, 8-25-2011. Belleview Schoolhouse. New location, view looking NE. Showing rear (north) elevation. Photo by S. Martin, 8-25-2011. Belleview Schoolhouse. New location, interior facing N. Photo by S. Martin, 8-25-2011. Belleview Schoolhouse. New location, interior facing S. Photo by S. Martin, 8-25-2011. Belleview Schoolhouse. New location, interior facing NE. Photo by S. Martin, 8-25-2011. Belleview Schoolhouse. New location, interior wall of east cloakroom showing notation beneath wallpaper: This school house painted inside & out two coats and papered June 1924 Contract price for labor 95.00. Earl Benjamin, Milan, Kansas.
. Photo by S. Martin, 8-25-2011. Belleview Schoolhouse. New location, interior wall of east cloakroom showing old layer of wallpaper. . Photo by S. Martin, 8-25-2011. Belleview School - Original location, 1953. Aerial Map of new location. Bing.com, 2011. Belleview School - Original location, circa 1920. Belleview School. State Register Nomination. 08/01/2011. Owners/Brunhoeber, Mike & Valerie.